Usually when I knit I use circular needles. Lighter than straight needles, circulars are flexible, nimble quick to the touch. Circulars make it possible to knit in the round. Recently, Mia, a young dynamic young social worker with sparkling dark eyes, asked me to teach her to knit. 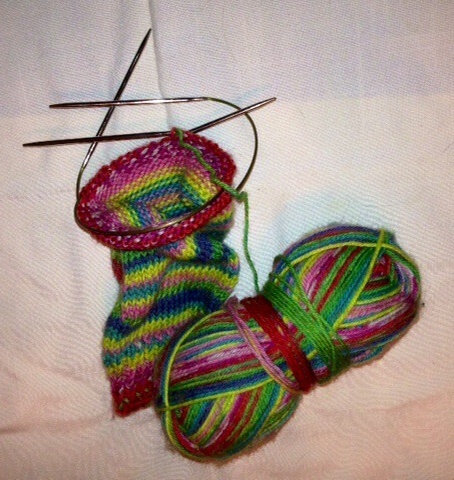 We had met on a social justice retreat where I was knitting socks on two circular needles. We briefly chatted over a lunch of mung bean soup and warm multi-grain bread, and I was pleasantly surprised when she e-mailed me several weeks later about knitting. We met for coffee and pulled out the needles. I started to cast on, knit one pearl two, create ribbing. Mia talked about her commitment to counseling women who struggle with poverty and abuse. I smiled at her excitement on becoming an advocate for justice for these women. As she reflected on what had lead her to that path, I saw her childhood in the crisp golden autumn of a Michigan upbringing. The conversation turned to my daughters so close to her in age and to Aunt Margie who gave me my first set of needles decades ago–to my story. Finally, we talked about faith. What keeps the spark of the divine within us alight despite the failings of religious structures? How do you get past rhetoric and dogma to hold what you know is true? At the end of the morning I wasn’t surprised that we had only completed a few rows. Instead we has created a circle of story. Next time, perhaps we will knit socks.